Educators are adept at avoiding chain reactions. Especially those of us who work with middle school students. We are leery of situations that might careen out of control and we have become experts at subverting proverbial avalanches. Middle school students definitely need structure, and sometimes limits. There have been a number of times, that I have been at the center of breaking chain reactions (even using some of the examples above). In fact, I think I’m pretty good at identifying potential issues before they become a deluge. Like the member of the ski patrol who fires off a charge to start a small avalanche, in hopes of avoiding a big one. However, sometimes I wonder if our propensity for analyzing situations for “chaos potential” inhibits our willingness to provide our students with opportunities to create, collaborate and problem solve. Those things are messy. They can be noisy. And they require a certain degree of risk. They require us to give up some of our control. Over the past several months, I have been working with our teaching staff to set off a chain reaction at our school. 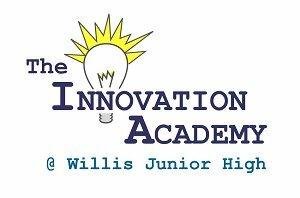 We have started The Innovation Academy at Willis to employ a blended learning environment and utilize available technology to provide an individualized, and meaningful, learning experience for our students. I have asked our teachers to take some risks, try something new, and embrace new technology to provide students with a more authentic learning experience. This is not an easy task. 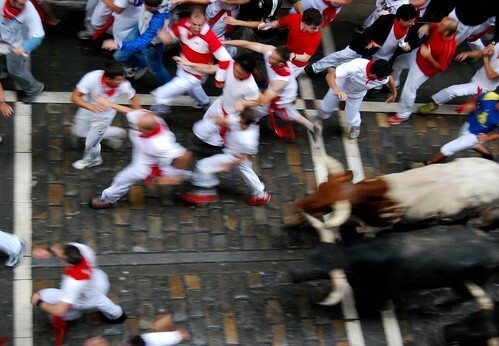 I envision that it might feel something like the experience of running with the bulls — it is a choice we make, but one with an added sense of urgency. Once you are on that path, you have to keep moving forward, lest you get run over by the bulls (or the junior high schoolers). While the iAcademy is a start, the hope is to see the integration of technology spread across our campus. As a new principal, I have been thrilled to see our teachers embracing the change and taking appropriate educational risks — trying new lessons, new approaches to teaching, and most importantly, looking for ways to engage students as creators. Many of our staff members have been using Edmodo to engage students in a social media environment. Members of our faculty have ventured into the Twitter world, working to build Professional Learning Networks and developing connections with other educators (@shultzwjhs, @tim4nd, @MrBartleyAZ, @ShandelRoberts, @ohizzle24, @suez1619 ). Teachers are blogging about their experiences — Keeping My Head Above Water. We have a teacher (@schultzwjhs) who is experimenting with the concept of a “flipped” classroom — Thoughts on My First Flip. In addition, our students are working with Glogster, Google Docs, and Classroom Collaborize. Blogging, Skype, podcasts, and video creation are on the horizon. The snow is beginning to slide down the mountain. Teachers are excited. Kids are excited. I am excited–about what I see happening now and about the possibilities that lie ahead. As a school leader, I view my role as that of a catalyst. Instead of looking for ways to stem the tide, I am looking for ways to keep it going. Working to clear roadblocks, acquiring resources, providing professional development opportunities and trying to be supportive as we encounter the inevitable bumps in the road. Change is rarely easy, especially when we work in a system that has been very slow to embrace meaningful change (sorry education…sometimes the truth hurts). We have a long way to go, and we could certainly use your help and advice. Help us maintain momentum. Please share your experiences serving as a catalyst, or agent, for positive change and technology integration.